This post requires a warning and here it is. If you don't want to get in my head (and I certainly don't! ), stop reading now. This will tell you what short but twisted path I took to come up with this idea and it's similar to that of my "Flying Monkeys ATC." Odd. Really odd. If you're still reading, consider yourself warned. As I mentioned yesterday, I've been in a scrapbooking mood and I sat down to work on that this evening. I had a sketch in mind. I had an inspiration piece in mind. However, I was browsing through my Google Reader posts again just in case there was something else that jumped at me for the project and instead, I got caught up on the current Wicked Wednesday challenge post- Frankie and his Bride. I actually thought I'd deleted it, deciding that I wasn't going to get to it because of the scrapping I wanted to get done this week. 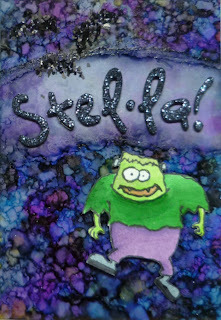 Then I decided that I REALLY wanted to break out my Frankenstein stamp and try it. So much for scrapping. However, our tale isn't over. I have Frank in a Stampin' Up set. That's it. One Frank. No others. And no bride. None. So. What's Frank to do with his Mrs. missing? Get upset of course. Yell and holler. That's great. What would he yell? Heck! What's her name? I don't know- does she have one? Who else yells and hollers at some missing chickypoo? What does he yell? Marlon Brando. Stella. He yells. Yeah. Wait! He yells STEL-LA! I can see Frank doing that! Heck. Does he in Young Frankenstein? He may. I think I'll have to go back and watch it soon to find out. Of course, I think it'll also require an Amazon order but that's ok. Back on topic Jen. Told you it was scary in here! So. End result. One of those agate techniques from Tim on the glossy background paper (I like this one- the backgrounds are always pretty funky and you can keep messing with them. I started with a 3 color layer. Went to 4. Ended on 5.) I used the Blending Solution to remove some of the ink so the black letters showed up. What didn't show real well were the black glitter bats up in the top left corner. The glitter was too chunky. You'll have this. Such a fun card! Great alcohol inked background and the 'stella' sentiment is real fun. Thank you for joining us this week at Simon Says Stamp and Show! I love, love, love using alcohol inks - this came out absolutely awesome! Love your story, too, you are so fun. :) Thanks for joining us at Wicked Wednesday, my friend! Love this Jen! Great post too! Just gorgeous!!! Love the background - really effective!!! Thanks for joining us at Wicked Wednesday!!! ROFL! Cute story and a fab image! 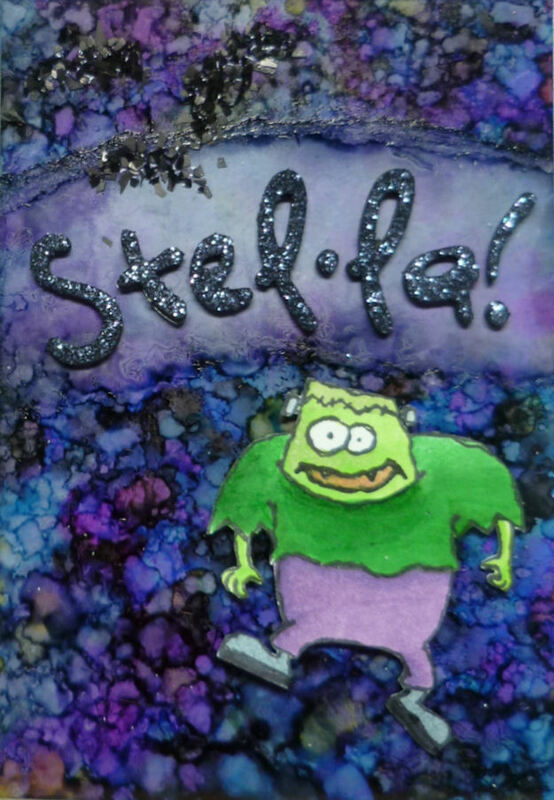 This is a great Frankie and Stel-la ATC! Sorry I'm running late on comments...I was on vacation last week and without internet! I should have been the one screaming (or maybe I was?!!) LOL! Thanks for joining us at Wicked Wednesday...it's always fun to see your little creations.